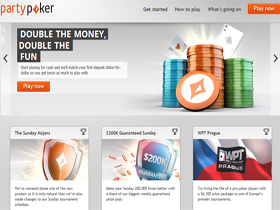 Party Poker is one of the biggest Poker sites on the net and has attracted a large number of players. They have broadcasting rights to the World Poker Tour and constantly come up with appealing promotions. Their tables have a nice design, and their graphics are simple with crisp sound effects. Party Poker offer popular games, such as Texas Hold’em, Omaha and 7 Card Stud. Party Poker offer banking options, such as Click2Pay, ClickandBuy, Electron, Entropay, MasterCard, Neteller, PayPal, Skrill (Moneybookers), Solo, Switch, Visa and WebMoney. Party Poker do not offer a live chat support system but the 24/7 toll free number or email response is excellent. They have friendly and knowledgeable agents ready to assist you with any query you may have. Party Poker was established in 2001 and is based in Gibraltar. They are audited by ItechLabs and are listed on the London Stock Exchange Market. Their security procedures and financial information is available for public inspection. Party Poker offers 100% up to $500 New Player Bonus with 60 days to redeem it. They also have a variety of promotions bonuses and exclusive tournaments on offer.